Last week my washer was acting up, and it wasn’t until the moment when I couldn’t do laundry that I realized just how much time I spend in my laundry room. Similar to the kitchen, it gets daily foot traffic and I find myself stretching every inch of floor and counter space to make the most of the small but mighty room. As an organizer, the laundry room is a space that is often on the lower end of our client’s priority list. It’s one of the spaces that isn’t as visible to guests and that (oftentimes) only one or two family member’s really use on a regular basis, so it tends to get the boot when choosing which area(s) to focus on getting organized. The things is, the laundry room is one of the best (and most simple!) places to add storage. After my client reached out and asked if I could take a look at her laundry room, before seeing the space I assumed that I would be offering suggestions on storage bins and maybe some general organizing recommendations. But, after seeing the laundry room all I could see was the potential. Sure, the washer and dryer took up a majority of the room, but there were blank walls that could be used to make the room so much more functional. So, I designed a storage plan specifically for this space to make the most out of the square footage. 1. Identify your needs. What’s working in your laundry room and what is giving you a headache? Understanding the pros and cons of your space will help figure out areas where improvement is needed. Maybe you are tired of seeing your drying rack on the ground, so finding a way to hang it would be a great improvement. Figuring out what you need will help steer your research and creativity in the right direction. For this client, there were a lot of categories that needed to be stored in this room (ranging from laundry supplies to utility items and even linens), but that resulted in piles and the inevitable eye sore when walking into the room. There needed to be dedicated spaces for each category, without sacrificing hanging space to dry clothing. 2. Take measurements. Sure, you can bookmark inspiration images all day long, but unless you are willing to demo your space and start from scratch you are often limited to work with whatever space you have available to you. Know your limitations and get creative! Use the back of doors, above the washer/dryer, and open wall spaces as potential storage space. Pinterest is always a great starting point for getting inspired (be sure to check out our boards!). 3. Incorporate products/redesign. We’ve worked on projects where simple things like shifting the washer and dryer over by 12” allowed for a bank of shelving to be added. If you are tight on space (and budget! ), but there is an opportunity to play with your existing layout, start there. The small spatial shift can open up opportunities for incorporating products that otherwise may not have been possible. 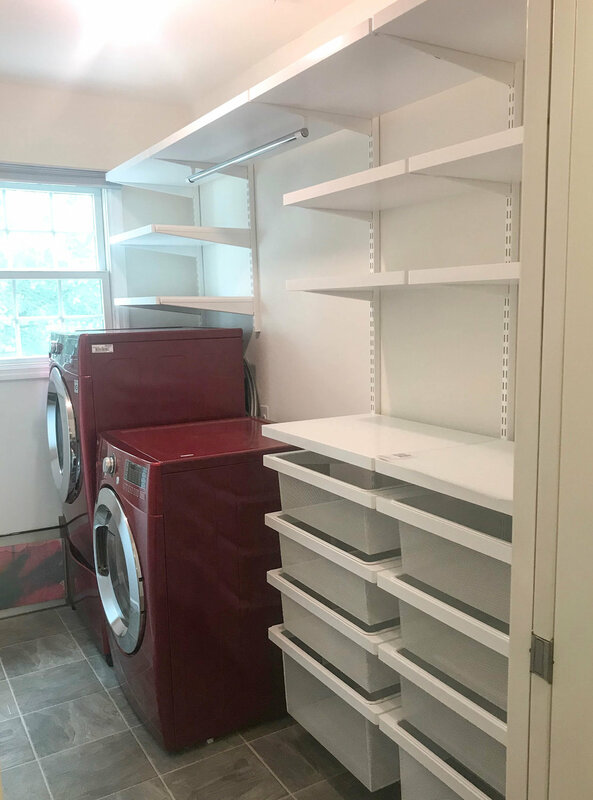 The addition of drawers eliminated the need for many products, but we always find that clear bins in a variety of sizes are helpful to contain items, especially if you are storing a variety of categories and treat your laundry room as a multi-purpose space (like our client does!). I’d love to know: Do you have designated laundry days in your home? Who is responsible for cleaning the clothes and putting them away? Feel free to share in the comments section below!